Why Are We Burying Plastics? While our nation’s recycling rate has shown year-over-year growth for decades, the unfortunate reality is that most of our used materials are buried in landfills, entombed for untold generations. This is an incredible waste of resources—that “garbage” we regularly place at the curb could provide a key to a more energy-efficient America. That’s one reason why the plastics industry is championing efforts to recover the captured energy in plastics through waste-to-energy technologies, plus three new technologies that create fuels and feedstocks. The molecules that make up plastic products are a powerful source of energy. For example, in a facility that converts waste into energy, non-recycled plastics can supply more than 15,000 BTUs per pound (35,000 kJ/kg). That’s more energy per pound than any type of coal. 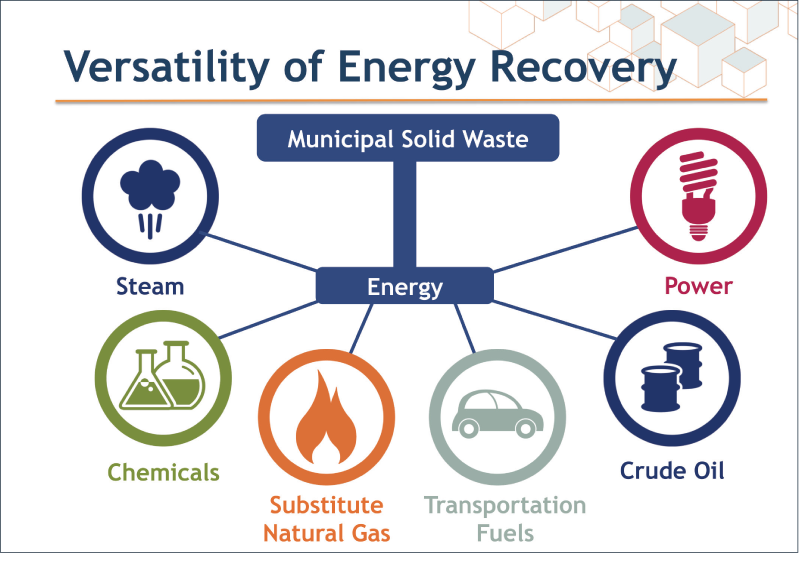 And because plastics have a higher energy value than other garbage (or “municipal solid waste”), they help increase the efficiency of the energy recovery process in traditional waste-to-energy facilities. How much energy is available in our garbage? Scientists at Columbia University found that if we were able to convert all non-recycled plastics to energy, we could power 5.7 million homes. If all municipal solid waste headed to landfills were able to be diverted to waste-to-energy facilities, enough electricity could be produced to power nearly 14 million households—or more than 12% of American households, powered solely from garbage. So as a nation we have a domestic source of energy that could power 14 million homes every year. And we’re burying it? Rather than burying this stored energy, some communities are recovering it. But not enough. Today’s 83 waste-to-energy facilities produce enough electricity to power only two million homes, diverting less than 12% of our garbage from the waste stream. Other nations are far ahead; Japan has 40% fewer people than the USA yet converts nearly twice as much waste to energy. There are more than four times as many waste-to-energy facilities in Europe as in the USA. And primarily through recycling and energy recovery, Germany landfills only one percent of its waste. Waste-to-energy can reduce landfilled waste by up to 90% and is widely considered a renewable, low-emission source of power that provides well-paying, domestic energy jobs (you can’t off-shore garbage collection). And the U.S. Environmental Protection Agency has found that waste-to-energy produces electricity “with less environmental impact than almost any other source of electricity.” EPA estimates that energy recovery technology in use today helps prevent the release of 33 million metric tons of carbon dioxide annually. But this type of waste-to-energy technology is only one way to recover the energy inherent in non-recycled plastics. Today, there are innovative, promising technologies that can turn used plastics into fuels and other valuable materials. 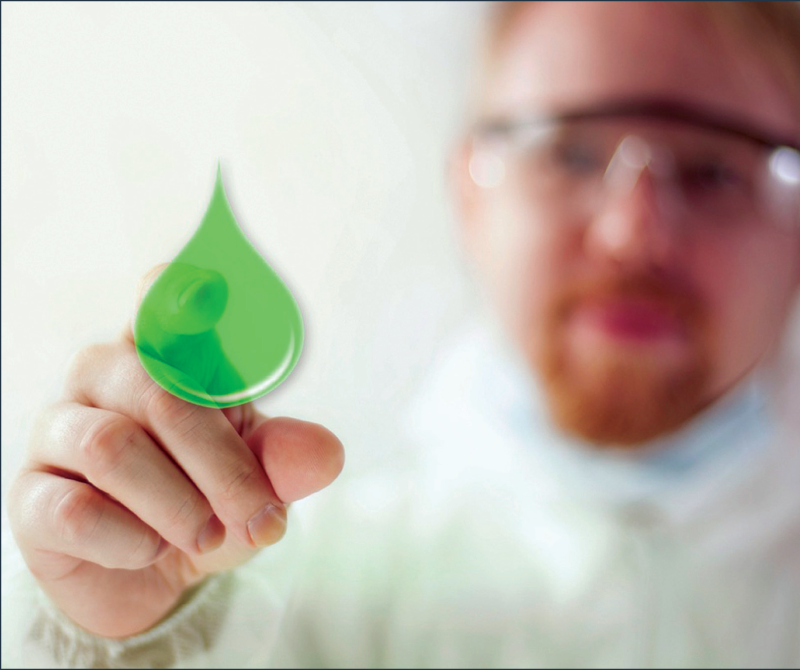 The Plastics Division of the American Chemistry Council (ACC) has helped sponsor numerous demonstration projects and is working with related industries across the country to help jumpstart three emerging technologies. First, plastics are collected and sorted for recycling (as recycling plastics is widely preferred over energy recovery), then non-recycled plastics are shipped to a plastics-to-oil facility. These plastics are heated in an oxygen-free environment, where they melt into a liquid and then vaporize into gases. The gases are cooled and condensed into a wide variety of useful products, such as synthetic crude oil, synthetic diesel fuel, kerosene, and more. Plastics-to-oil holds enormous promise: One company claims that its system can convert 50 tons of plastic waste into 26,000 gallons (98,000 L) of oil—per day. If all the non-recycled plastics in the USA were able to be converted this way, we could create enough oil to fuel nine million cars for a whole year. Engineered solid fuel: This technology turns non-recycled plastics (and other materials) into solid fuel pellets that someday could be used just like traditional solid fuels, such as coal, at facilities that make steel and cement and other products. The research into this technology generally focuses on the non-recyclable “residue” left over from recycling facilities. A recent test demonstrated that engineered solid fuel made from this residue (a mix of waste plastics and waste fibers) could be used as an alternative fuel at a cement kiln. The solid fuel’s energy content is similar to that of bituminous coal used in cement kilns, and significantly higher than sub-bituminous coals and lignite coals. An analysis of the test data showed that replacing coal with this solid fuel could reduce fossil energy use by approximately six percent annually at the cement kiln—equal to the amount of coal needed to provide electricity to 1500 homes for a year. To put that into larger perspective, if we were able to convert only five percent of the residue that passes through U.S. recycling facilities to solid fuel, that could displace enough coal to power 700,000 homes, plus result in the equivalent CO2 reduction of removing more than one million cars from the road, all with materials that are now being buried in landfills. Gasification: Plastics also can be converted into a gas fuel that can be used to produce electricity or turned into liquid fuels and even raw materials (chemicals) for manufacturing. Gasification is nothing new; it has been used worldwide for almost 200 years to convert carbon-based materials into energy, heat, fuels, and chemicals. Gasification of wood waste and agricultural biomass, for example, is commonly used for electricity and heat production. But gasification of garbage is not yet widespread. While Japan and South Korea have been using gasification for garbage and industrial waste for a couple decades, commercial facilities in the USA and Europe have yet to take off. However, interest in gasification has grown in the last decade in the USA. There were 21 companies with pilot and demonstration facilities in 2013, plus 17 commercial-scale facilities under development or construction. The primary output of gasification is combustible synthesis gas (syngas), which is valuable as a fuel or intermediate. Syngas can be used to produce power, converted into liquid fuels (like ethanol), and processed into hydrogen and methanol, which can be further processed into myriad fuels and chemicals. These energy recovery technologies hold plenty of promise. But the questions remain: Can our nation make the shift from viewing used plastics and other materials as waste, to mining them as a resource? Will these technologies help spur us to tap the energy potential of plastics and other wastes, instead of burying them in landfills?